Currently Working on a benchmark Test to run inside the browser. Still have a bit of work to do, as the only four tests currently included are considerably bad. Got most of the hard work out of the way. Had to make a dynamic resource loader to handle streaming packages. If you want to run it in a full page just for fun then run the fullpage version in non benchmark mode. or just watch the YouTube Video instead. Around 100 fps in the particle test and slightly above 3000 fps in the second one (Core2 Quad @3.2Ghz, Radeon 5870, Vista Ultimate 32bit, Java 6). did try it earlier on my work machine and it was working fine. Ill get rid of the animated banner. What OS java version are you running? Java 6u22. Windows 7, Chrome 7, Intel graphics 4500HD, Duel core 2.26, 4gigs ram. I made a few changes recently so it may be due to that, Ill need to test on a friends laptop. edit: think I fixed it, was getting the same exception on Mac. It's working for me on Linux now (was getting the exception earlier). Particle test went up to 650 fps with the new version on my machine (see above). How about some way to submit scores to a database so we don't have to post in this thread? Started putting my water shader code into the benchmark. 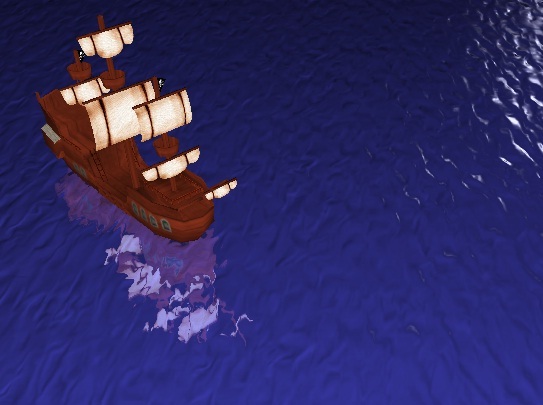 Going to add a pirate ship and sea monster reflection/refractions, aswell as a day to night animation. maybe change the specular colors to suit. Going to add the benchmark to Facebook, so people will be able to "Share" the GPU score at the end of the ("run all") test. Also: If someone else has been programming in LWJGL and would like to submit a benchmark test for me to Port over to the applet that would be awesome. Main thing is to make sure that your code does all the relavent GL error checks to allow for an error free applet. nice, works well here, ship demo runs at about 760fps. Really nice look water, especially the sun effect. Something odd about the ship though, looks a bit flat, maybe no normals used on it or something? Well spotted, I forgot to add lighting to the object. Fixed it. Also changed the water so it doesnt look like a toy ship in a bathtub. Still planning to add a sea monster (to show off refraction), and a day to night cross over for lighting effects. ah brilliant, looks much nicer now. Now all it needs is two ships instead of one, both travelling from opposite sides of the screen with little cannons that fire. Oh and don't forget some sound. Still havnt found an effective way to publish scores. hopefully it isnt that hard. Im thinking I might try use the share function in facebook. and pass the score to the URL via a query string. If anyone has had experience using facebook, I'd love to know the best way of handling score publishing. Love the pirate ship in the water, looks fantastic. 200 FPS. But when I closed the tab with your applet in GoogleChrome it locked the browser and I had to kill the task manually. Windows Vista. thanx, I tried to do the same on Windows 7, Google Chrome version 5.0.375.70 and it didnt crash. Ill install chrome on a friends version of vista and debug it. I just re-tried it and the same thing happened. Also happens in firefox. Btw there was no error thrown in the console. JavaSound doesn't work too well here under linux (especially if your mixing with OpenAL). Also likely JavaSound is hogging more resources (thus effecting the benchmark). Better to just do everything through OpenAL (try Slick-Util if you need support for some alternative sound formats). Ill go over all the Threads again to make sure that I havnt broken anything when cleaning up resources. Good to know, Ill look into the Slick music player. Currently Im just using the Jogg player.